In January 2000, the Fuel Cell Center (FCC) was established by Dr. S. H. Chan, Far Eastern Energy Distinguished Professor and former president of Yuan Ze University, with a 5 – year financial support from the Energy Research Fund of the Energy Commission. 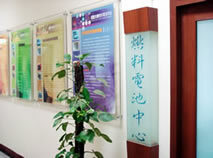 The center was selected by the Energy Commission (now the Energy Bureau of Taiwan) to establish as the university fuel cell center of the nation. The FCC has subsequently selected by the Ministry of Economy as the university to develop high efficiency low cost fuel cell technology, and by the Energy Bureau for the 4-year phase two program to develop high temperature PEMFC components, and by industrial and other sponsorships for joint research and technology transfer.